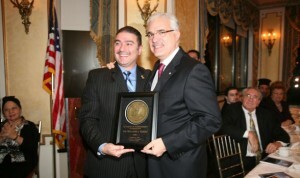 The American Hellenic Educational Progressive Association (AHEPA) honored excellence in several professions at its "National Regional Salute Banquet" held Sat., Nov. 21, 2009, at Terrance on the Park, Flushing, N.Y. Among the honorees were Senator Robert Menendez, Congresswoman Carolyn Maloney, Dr William Tenet (shown in the photo with Supreme President Nicholas Karacostas), philanthropist Dimitris Kaloeidis etc. More than 350 AHEPANs and their families attended dinner. Among them, former CIA Director George Tenet presenting his brother, Dr. William Tenet, with the AHEPA Academy of Achievement Award in Medicine; and Greek Ambassador to the U.S. Vassilis Kaskarelis, Cypriot Consul General Andreas Panagiotou and PSEKA President Philip Christopher offering remarks, as well as the Consul General of Greece Agi Balta. Past Supreme Governor and Past Sons of Pericles Supreme President James Gounaris served as Master of Ceremonies. The New York gala affair was the first of four AHEPA National Regional Salute Banquets to be held in 2009 – 2010. Traditionally, AHEPA hosts a Biennial Salute Banquet in Washington, DC every two years. However this administrative year, the Supreme Lodge decided to embark on a new and fresh approach by taking this historically gala affair “on the road” to four geographically disperse communities. Future venues include: Portland, Ore., on March 6, 2010; and Chicago on April 24, 2010. A fourth venue will be finalized soon. AHEPA Supreme President Nicholas Karacostas pointed out that AHEPA, founded in 1922 in order to protect Greeks from racism and ethnic discrimination, today has set the goals to promote philanthropy, education, social services to the community. “AHEPANS serve our country with dignity and tonight we honored excellence in public service, philanthropy, and in one’s chosen profession,” said Supreme President Karacostas. “You should be proud to be members of such an organization”, told the Ahepans Congresswoman Carolyn Maloney, one of the honorees. He mentioned her close cooperation with AHEPA to promote the issues of Cyprus, Macedonia, the Patriarchate and the visa waiver program. Carolyn Maloney, co chair of the Hellenic Caucus in the U.S. House of Representatives, said that since the founding of the Caucus, no anti-Hellenic resolution passed from the Congress. Honoree Dr. William Tenet said “AHEPA is the focal point of our efforts to help our community”. Son of an AHEPA member, Dr Tenet recalled how proud his late father was for that. “His AHEPA membership certificate had a prominent place in our house, because it meant service to the country, the family and the community”. Georgia Kaloeidis, speaking on behalf of here husband thanked AHEPA for the award and promised to continue their efforts in helping the community and Hellenism worldwide. 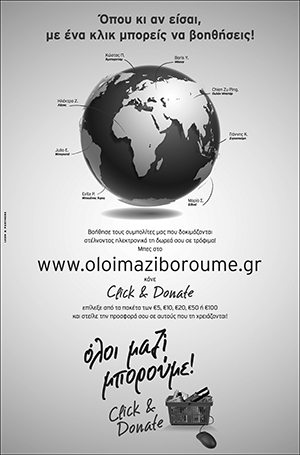 “Greek Americans today have much progressed and lead the way in the Academia, in Business, Sciences and every other field in the United Stated. And for this much is owed to AHEPA”, said Philip Christopher, President of PSEKA and a member of the AHEPA. The Ambassador of Greece Vassilis Kaskarelis praised AHEPA’s struggles and many accomplishments during its 82 year long history and the honorees for their service to Hellenism and the community. “You have proven that our community must work collectively and in unity, in order to achieve its goals”, Ambassador Kaskarelis said, also praising Supreme President Karacostas for his leadership.